When I was growing up in England the TV had three channels. True story. There were the two channels operated by the BBC. BBC 1 was on for most of the day. I could tune in around to 9 a.m. to children’s programming. By 1 p.m. BBC 1 switched to news, cooking shows, or horse racing. By 4 p.m. it was back to children’s programming. Before the evening news and a few drama shows (think: Masterpiece Theater), and finally the news. No more TV after 10 p.m. or so. Now the other BBC channel was BBC 2. This channel switched from a test card pattern to programming at noon before shutting down at about 9 p.m. I never saw any reason to switch on BBC2. Ever. Sheep dog trials never held my interest. The final channel of the three was ITV. This channel had a bit more variety. Fewer news shows. More comedies. Wish I could remember some titles of the shows. One show starred a very young Tracey Ullman as the daughter in one of those turgid, but riveting family dramas. This was in the days before Ullman was more well know for her comedy shows and songs. I was rarely sick. Loved school. So, if I was off school it was because I was REALLY sick. Around 15 I had two weeks off school because of the chicken pox. I couldn’t wait to get back to school. Aside from colds here and there, I was healthy. Living in cold, damp, dreary Manchester made for a sturdy constitution. In fact, I wore a pleated skirt to school every day with only a wool blazer for warmth. As I say, I was made of stern stuff back then. Now I seem to get colds more frequently. I’m too used to central heating. Most homes in Britain back when I was growing up had gas fires and electric radiators. I would get chilblains on my feet from resting them on the radiator as I did my homework at my desk. Looking back, was I ever warm when living in England? On days off school I would settle down on the living room settee. A settee is another word for a couch. Once settled with a pillow and blanket, I was ready for a complete day of TV watching. Only, there were only THREE channels. I’ll let that sink in for a moment. And the TV did not have a remote control, which was OK since the there were only three channels. It was a color TV so it wasn’t completely the stone age, but almost. My day of rest began with the full gamut of children’s programming. I may have been 10, but I was definitely not averse to watching Playskool, a show designed for 3 year olds. 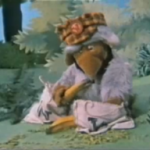 Camberwick Green and Trumpton were Claymation shows about small towns “Pugh, Pugh, Barney McGrew, Cuthbert, Dibble and Grub,” was cry of the lead fireman at roll call. Bagpuss — was about a saggy, baggy cat who came to life when Emily, the little girl who owned him, left her dad’s store. There were other characters…animals perhaps? I recall a bird who sat on a perch. The bird was made of metal. By noon children’s programming was over. I’d suffer through a dreary half hour of the midday news. Did I really need to hear about horse racing scores? I think not. Did I need to know that the weather would be raining…again? Next up, cooking shows — great if you had a hankering to make haggis or steak and kidney pudding, but rather snooze worthy for a sick kid. If I could stay awake through the cooking show, I’d be treated to Pebble Mill at One. Now, Pebble Mill at One was a cross between Hoda and Kathy Lee and Anderson, but with really down homey themes and extremely run-of-the-mill guests like a third-tier star on a soap opera. Once through the talk shows of the afternoon, it was naptime. After an afternoon snooze, I would wake up long enough to watch the afternoon children’s programs (or programmes). One show stands out — Blue Peter. This was a show with changing group of 3 presenters. In my day it was Lesley Judd, Peter Purves, and John Noakes. For as dead dull and boring as Pebble Mill at One’s lineup of guests was, Blue Peter had an amazing variety of guests. Blue Peter introduced a whole audience of kids to disabilities, for instance. Through a lengthy campaign, kids could contribute to helping people with cerebral palsy and other disabilities. The show took film crews to hospitals and group homes. One of the guests was an older man with cerebral palsy who couldn’t communicate very well. He needed an interpreter or perhaps he used a communication board. Later on when I watched My Left Foot I knew exactly what Daniel Day Lewis’ condition was. What was your favorite TV show from childhood?